This is a great looking product right out of the box. You can tell it is made sturdy because there are no cheap plastics or other shabby materials used in its construction. Included right in the package are the two rechargeable AA batteries that it requires also. Once you insert the batteries and read the product users guide that is included, you are ready to start seeing in the dark with this handy night vision device. You also get everything you need with this really nice monocular night vision product right in the package it comes in. That also includes the protective case, carry strap and lens cleaning cloth too. Firefield has been pretty thorough here to say the least. It’s no secret that night vision products tend to be a little on the expensive side. That is why we chose to start off with an introductory type night vision product that is highly affordable. Just because you are on a budget or not sure whether night hunting will appeal to you does not mean that you shouldn’t be able to get your feet wet doing it at a decent price. That is exactly what you get with this monocular night vision product from the reputable Firefield Company. They are an established leader in products that enable you to still see long after the sun has gone down. This great introductory night vision product does nothing to hurt their excellent reputation. This powerful night vision device uses infrared light to paint a picture of your surroundings after dark. Some people think that infrared imaging is not the way to go with night vision products but that is hardly the case. These days the technology is so advanced you can see very clear images of heat signatures even if they are very far away from you. Not only does it feature technology that puts out very high digital image resolution but it also gives you multi-coating on the lenses to help make the images that it produce even clearer. When you add to all this 12mm eye relief technology then you have a product that will really up your game when you go after your desired prey at night. The optics on it will also enable you to conveniently zoom in and out on your potential targets. This handy night hunting device offers you a full 5 power magnification. That means that you can zoom in to identify prospective game even when they are several hundred feet from you. This is something that is not only great for your hunting but it will make it safer if you can positively identify the target you are shooting at too. The lens on the optics is also a full 50 mm lens. That is a lens that will really give you a very wide viewing angle. These monoculars will give you a full 15 degree field of view from of the terrain as you scan anywhere from 600 – 3000 feet away from you. It is nice to be able to scan that far from side to side when you are looking for game to shoot at night. You bet. One of the best things about it is that it’s a very weather resistant design. That is a great feature because we all know that some of the best hunting is done on days when the weather is a little off. It’s nice to not have to worry about ruining your night vision girl when you are out in adverse weather. But don’t mistake this for being able to totally immerse it in water because that will most likely ruin this monocular night vision device. This monocular night vision instrument is durable too. It has a rubberized armor coating on it that will go a long way toward keeping this unit in good shape. It is highly resistant to cracking, warping, punctures and more. That is a good quality to have for a night vision device that is being used in a hostile environment like woods foothills and underbrush. 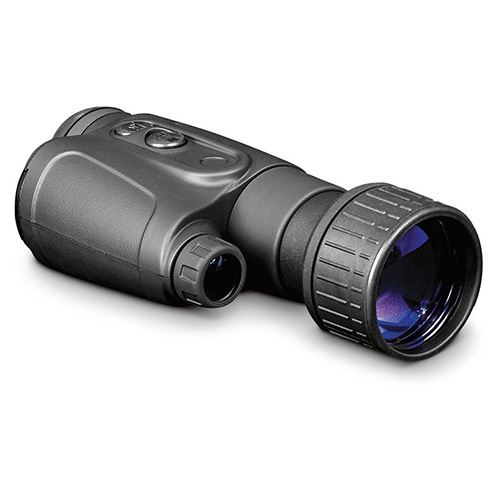 It is also a night vision product that is very ergonomically designed to both hold and use. Hunting with these is so much better than trying to use just a night vision scope on your rifle. You have all the adjustments for it right at your fingertips and you get much less eye strain because of the clear night time images it gives you. Don’t get me wrong I absolutely loved the price on this handy night vision device but that is not the best thing about it. It has to be the image quality you get with this monocular night vision product for that price. It is nice to be able to scan the horizon from where you are sitting or standing without having to strain your eye while doing it and to also have a clear image of what it is you are about to shoot. You really can’t go wrong when you purchase these to enhance your night hunting experience; especially if you are a beginner at hunting after dark or you want to try night hunting out first before sinking a lot of money into more expensive equipment. The excellent infrared images it provides to you will give you a better than average chance at taking down the game you desire in the dark. I have no problem whatsoever recommending these if it’s an affordable and effective monocular night vision device that fits your needs when hunting after dark.